A big talking point at the moment is Scotch eggs with a twist… a Cadbury Creme Egg enveloped in lots more chocolate yumminess. 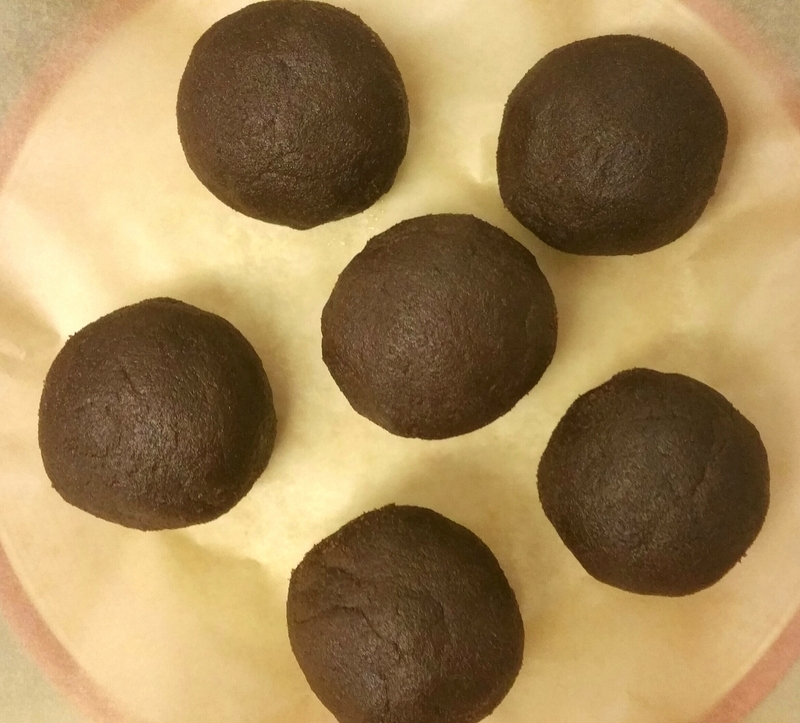 A friend asked me if I could make some and give her my recipe for them so she could feature them in her magazine. I’m not one to turn down any requests or challenges so dutifully trotted off to buy the essential ingredients. I “accidentally” bought more than I needed. 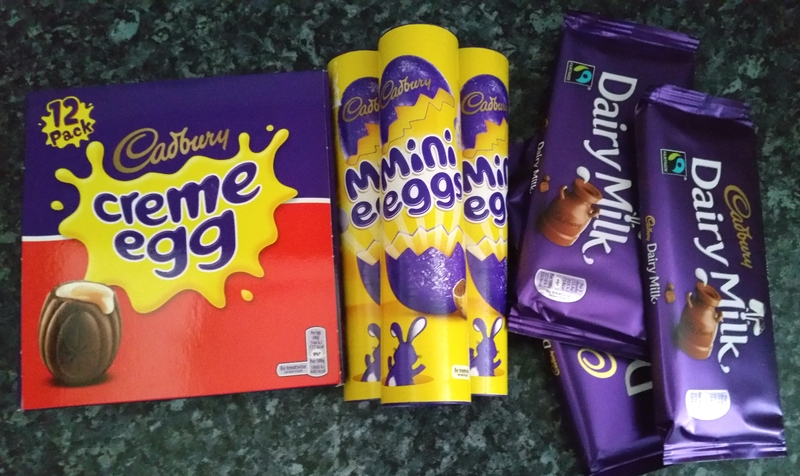 You can never have too many creme eggs, right? Here’s a few of the bits I bought. You don’t need this many unless you’re making loads!! Oops! This is where I wish I had a Cadbury Card for their shop! You don’t need to use Cadbury chocolate, but as the Creme Eggs are Cadbury’s I thought it would be nice to stick with them for the decoration too. 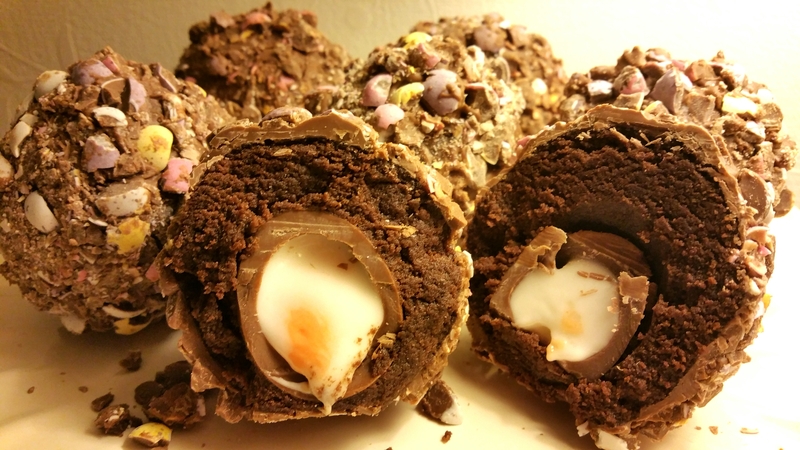 In case you haven’t seen them on social media or in newspapers, chocolate Scotch eggs are Creme Eggs surrounded by crumbled chocolate cake which has been mixed with buttercream, dipped in melted chocolate, and then rolled around in something crunchy to decorate. I’ve seen people use coconut, nuts, cornflakes… the choice really is yours. 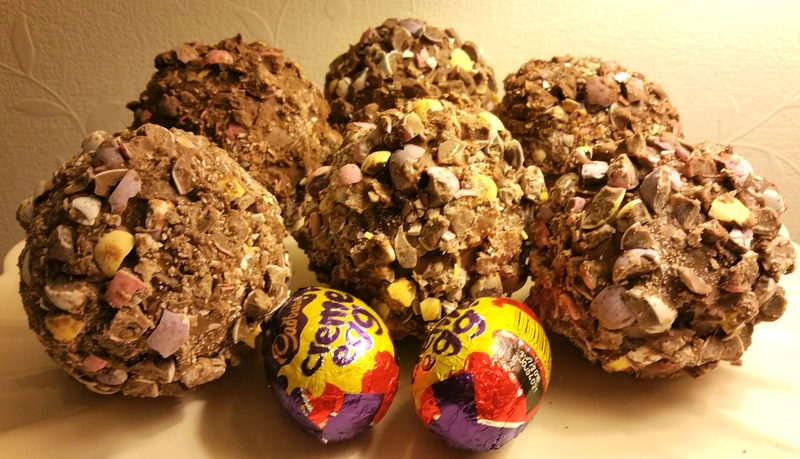 As it is nearly Easter though, my recipe uses crushed Mini Eggs. Any excuse for extra chocolate! And because the Creme Eggs don’t get baked, they stay perfectly runny and oozy. So here is my recipe. There are a few stages to making these and they are very messy to make but well worth it. Preheat the oven to 160C. Grease and line a 20cm cake tin. To make the chocolate cake, cream together the butter and golden caster sugar until pale and fluffy. Gradually add the eggs while beating well. If the mixture starts to curdle, add a spoonful of the flour with the egg additions. Sieve the remaining flour and the cocoa powder together and fold into the mixture with a spatula or large metal spoon. Pour into the prepared cake tin, and bake in the middle of the oven for around 25 minutes, until risen and springy to touch, or until a knife or skewer inserted into the middle comes out clean. Leave the cake in the tin for 10 minutes, then turn out on to a cooling rack to cool completely. To make the buttercream, sieve together the cocoa and icing sugar. Add the butter and beat well until light and fluffy. When the cake is completely cool, break it up into large pieces then blitz in a food processor until you have fine crumbs. (You can do this by hand if you don’t have a processor). Add the buttercream and pulse until it is all combined and sticking together in large clumps. You can do this by hand with a spoon if you prefer. Use your hands to press it all together in to one big compressed lump, then divide it in to 6 portions. Take one portion in your hand and press a Creme Egg down in to it. Use your hands to mould the cake mixture around the egg to completely encase it. Press quite firmly to make sure it is packed together tightly. Place on to a plate. Repeat with the 5 remaining eggs. Place in the fridge and chill until very firm. This takes around 1 hour, but the longer you leave them the better. Roughly chop the Mini Eggs, or place into a ziplock bag and bash with a rolling pin until they are crushed into fairly small pieces. Tip them out on to a plate. When the cake covered eggs are firm, break up the milk chocolate and melt in a heatproof bowl over a pan of barely simmering water, making sure the bottom of the bowl does not touch the water. Stir gently to make sure it is melted. Place them back on to the plate and chill them in the fridge until set, around 15 minutes. Enjoy! If you make these, see if you can do them WITHOUT eating half of the ingredients along the way. All I can say is it’s a good job I bought extra Creme Eggs, Mini Eggs and Dairy Milk!!! Oh heavens! Am I the only person who absolutely cannot bear Creme Eggs? Bleurgh!